If the only thing your attic does is conjure up images of cobwebs, ghosts, and spooky noises, that’s a missed opportunity. Your attic should be a highly efficient and organized storage space. Attics are traditionally great for long term storage of little-used items, as accessibility is often a major factor. This attic is in serious need of a storage solution. The vast majority of attics are large, unfinished spaces. If you are considering using your attic for storage, it’s a good idea to install a floor for safety. A traditional sub-floor would work, or you can use prefabricated attic floor tiles. This newer product, which is specifically made for attics, is strong, easy to screw into floor joists, and ventilated for insulation. Another important safety measure to consider is some form of railing or grab rail around a pull-down ladder opening. 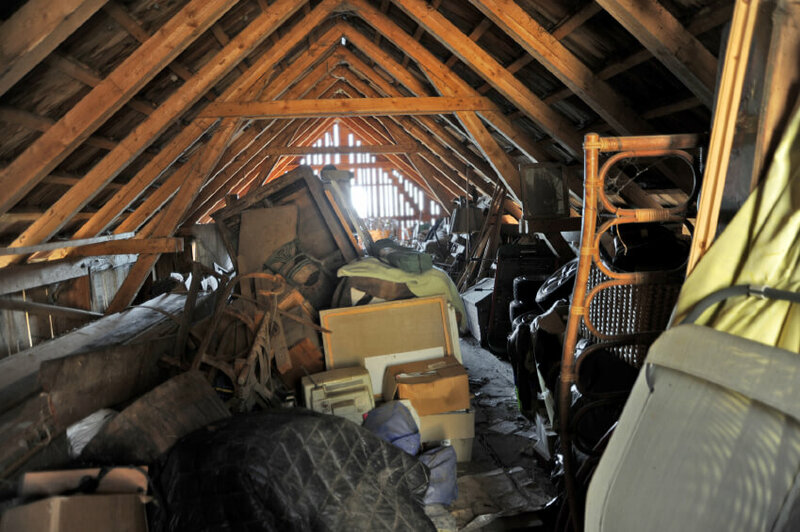 Once your attic is safe enough to begin storing items, take some time to develop a plan. Categorize all the items you wish to store in your attic and divide them into groups. For example, holiday decorations, family heirlooms, out of season clothes, old baby clothes, etc. For each group, determine how accessible it needs to be. Then you will want to create a storage plan for your attic. Divide your attic into zones based on accessibility so the items you need access to most are closest to the entrance. There are many different ways to store items. If you have a particularly high ceiling in your attic or a lot of flat items, consider suspending racks from the ceiling to create more floor space. Poles can be mounted between roof rafters for hanging clothes. Use the spaces in your eaves to add metal or wooden shelving for storing bins. You can even use the narrow space between wall studs for skinny items by attaching rails or wire shelving flat across the studs. Several companies manufacture storage systems designed specifically for attics. There are systems designed to make the most of the space between trusses that do not require a floor to be installed. Texas Attic Lifts makes an electric lift that lowers into your garage to easily and quickly move heavy and bulky items to your attic without having to battle a pull-down ladder. This is a great way to make your attic more accessible if it’s your only storage option. How you store your items is just as important as where. The main issues with attic storage are temperature extremes and accessibility issues. Any items not suited to extreme temperatures should be stored elsewhere. Loose items should not be stored in your attic. Use plastic bins or containers to protect your possessions from insects and rodents. Vacuum-sealed garment bags are a good way to project hanging clothes. Consider using clear plastic bins so contents are visible, and also label everything to make it easier to find. If you’re thinking of finishing your attic, you will want to make sure you take all your storage needs into consideration. It’s a good idea to take an inventory of what is currently in there and determine what you will need to store there in the future. A good majority of attics have a lot of little nooks and crannies that may be wasted space in a finished room. You will want to consider adding built-in storage to these areas to maximize your space. The eaves are a perfect place to build in drawers, closets, and shelves. Movable storage units designed to be fitted up against sloping ceilings are another option. These free-standing units have a flat front with a handle to pull out for storage and are not built into the wall. Whatever you decide to use your attic for, a little organization and elbow grease can turn it from wasted space to an integral part of your home.